High security pinless hinge. Zinc plated hardened steel for added strength and weatherability. Hardened steel staple resists cutting, sawing and hammering. 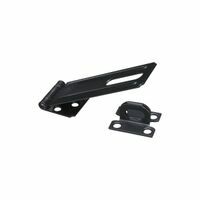 Hasp body conceals mounting hardware. Use for securing utility vans, trailers, gang boxes, and vending machines. Accepts shackle diameter up to 7/16".